Wedding cakes - take a bite of hope. Take a bite of dreams. Take a piece of forever, ever after, the all and the everything. And we all, we spectators, we encouragers and witnesses, we will bite into the hopes as well. Masticated dreams. Delectable wishes. 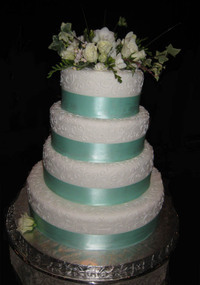 Our layered wedding cakes come from an old English tradition, based on an architectural design for a steeple on St. Bride's Church on Fleet Street in London (see my post, Traditions: Bride's Cake). My daughter's wedding cake design was magnifico. Traditional yet with her touch of color, entwined with her Midori sea foam ribbon. My sister-in-law, her aunt, arranged it to be just-so. It was the centerpiece of the reception. Would you ever have thought that an architect, reaching a spire to the sky, would be so noted today in our symbolism of layered hopes for the new couple, reaching skyward to heaven with this old, old tradition? Eat it up. We did. I love the history and the symbolism! Beautiful cake. As a wedding cake designer in Austin, Texas I loved it.